If you like to occasionally entertain, or if your idea of winding down involves a cocktail, then a bar cart or wet bar can be a great addition to your home. Forgo the “Animal House” theme decor, and follow our guide to get the look you want for your home bar. 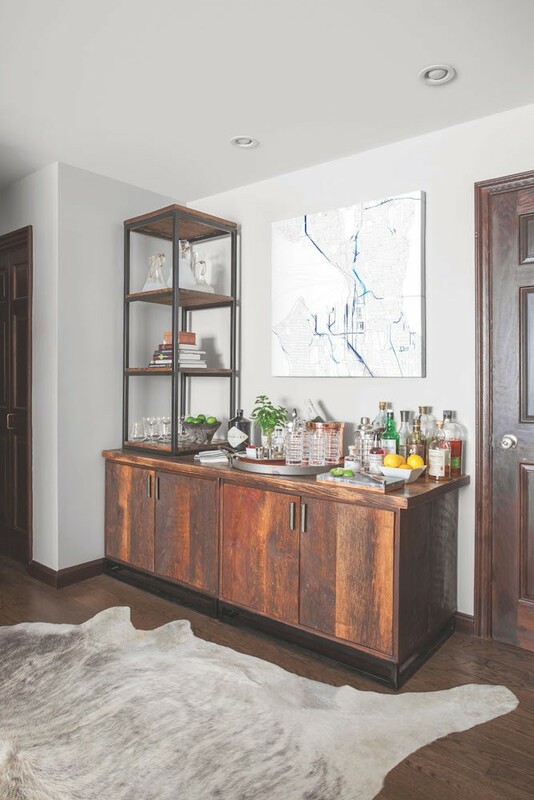 If you don’t have the space for full-blown built-in wet bar, then you may be wondering how to get the right look for your home bar. Consider parts of your space that are being under-used, like a shelf that can double as a home bar. In this Sag Harbor weekend getaway, we picked a shelf that’s just above waist level, and stocked it with home bar necessities. We always push our clients to incorporate bright pops of color into their home designs. It creates a compelling palette, and creates a vivid contrast against a neutral scheme. But bright pops of color can also demarcate different areas of your home. In this SoHo duplex, we added a few bright-yellow accents to the home bar, so guests know exactly where they can get a drink. One way to make your home bar feel cohesive with the rest of your home is to incorporate similar materials and textures. 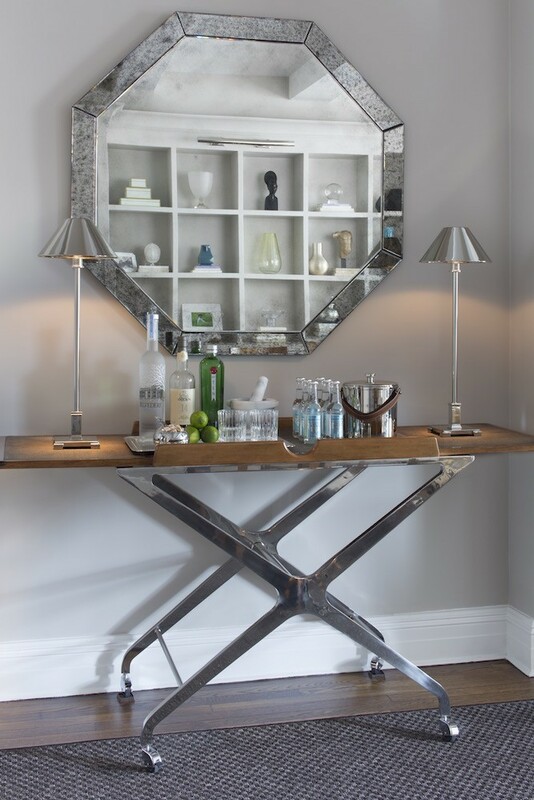 To compliment the chrome mirror in this Upper East Side apartment, we sourced a bar cart with chrome legs, for a chic, modern look that feels cohesive with the rest of the apartment’s decor. Although the days of speakeasies are long gone, we still love the look of a hidden home bar. It’s a subtle way to add a bit of pre-war flare to your abode. In this Upper East Side townhouse, we installed an elegant wet bar, and hid it behind a push-latch walnut wood panel. If you don’t have the space for a full wet bar, the consider repurposing another area of the home. Our clients in this Hoboken apartment love to entertain, and so we installed a home bar in the foyer, so that guests can make themselves at home, as soon as they walk in the door. And don’t let your bar go undecorated. To give this Union Square loft a bit of old-New York charm, we added in a vintage clock and a black and white photograph. And a home bar doesn’t just have to be for entertaining. In this colorful TriBeCa loft, our clients wanted to create a space for a home bar, while also giving their dining room some additional storage. So we killed two birds with one stone by turning a console into both.